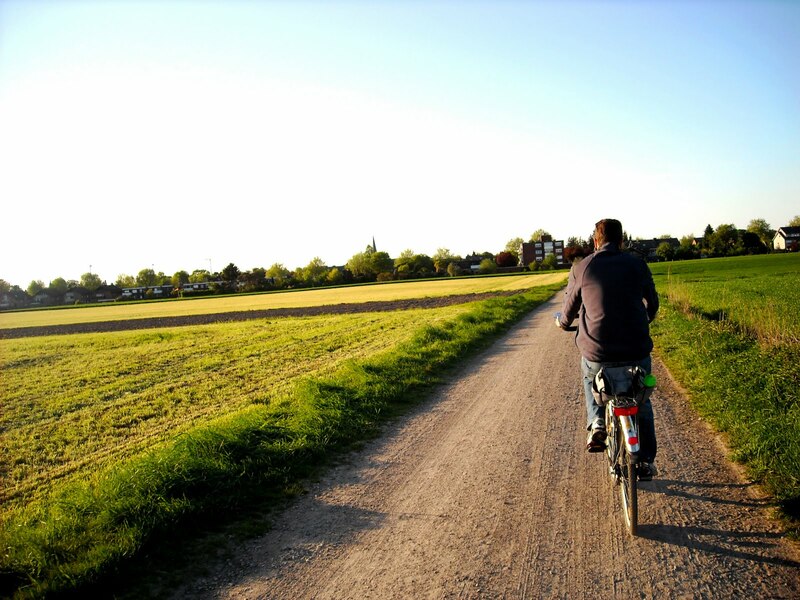 For all of the times we have traveled to nearby Essen and Köln, we have only stopped in Düsseldorf one time. Our only recollection of that trip 8 years ago was going into a bar and wondering why we weren’t getting any service. After 15 minutes, we realized we were in a gay bar and quietly walked out. That was our first and last trip to Düsseldorf. Tuesday evening after work, I traveled by train to Düsseldorf in order to give the city a second chance. One thing lacking about Düsseldorf compared to other big cities in Germany is that it doesn’t have the ‘awe factor’ when you walk out of the train station. Köln has the best awe factor when you walk out of the train station and immediately see the Dom Cathedral, and even Essen has some awe to its city center to a certain point. Düsseldorf has a doner shop outside of their train station and that’s it. This time, I took the U-Bahn (subway system) from the train station towards the Rhein River and arrived at a really cool part of Düsseldorf. I have never heard so much English being spoken by other people since we have been in Germany. Dana and I can go there when we get homesick. Had a great conversation in German with this lovely couple. The sun going down means that I should already be on a train back to Borken. Instead, you get to laugh at my misfortune. Anyways, Düsseldorf was a beautiful city. The real story happened on the way home, however. I had a train change in Essen and was planning on taking the last train to Borken at 10:30pm. Unfortunately, the train that I was on arrived in Essen 5 minutes late. That means I was 1 minute late for the last train to Borken. The next train to Borken was at 6am and I was not in the mood to pull an all-nighter as a homeless person in Essen. I ended up walking the streets of Essen for an hour going from one full hotel to another. The only two open hotels were €100 and €140, respectively. For that price, I would rather sleep in the park and save the money. Instead, I went back to the train station and looked at my options. There was really no way back to Borken before 6 am, even through a different city. I decided to take the midnight train to Münster…a place I was at least more familiar with. In Münster, I could see if there were any night buses towards Borken (at least try to get me within taxi range.) There were no options, so I decided to walk to my office. paint. I opened the window, laid down my jacket as a make-shift pillow and tried to sleep for a few hours. After a few hours (ok, 3 or 4) of tossing and turning and a major case of permanent rug burn on my arms and legs, I woke up and walked back to the bus stop and took the first bus to Borken. 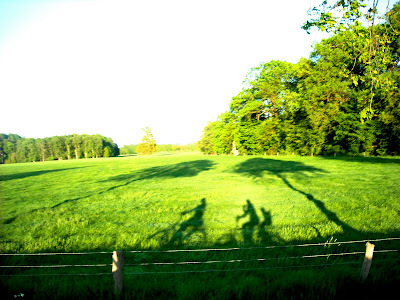 When I spoke to Dana the next day, I only wanted to talk about my time in Dusseldorf. I mentioned, in passing, that I happened to miss the last bus to Borken and had to spend the night in my empty office in Munster. She busted out laughing and insisted that I write a post about it. So, here it is 9 readers; my post about my night in Dusseldorf, I mean Essen, I mean Munster. This is a follow up to the American (Pop) Culture Shock post written last week. Since our audience of our American and German readers are split almost direct in half (ok, it’s 5 to 4 to be fair) I’ve decided to give a top 3 Pop culture list for Americans who really want to fit into the German culture when you come visit Germany. You will win instant friends over here if you add any of the below in normal conversation. 1. Eurovision Song Contest. This is Europe’s American Idol, before American Idol became lame several years ago. You can bring the European Song Contest up with anyone and they will instantly engage you in a conversation. In fact, the main reason I came home early last Saturday night from Dortmund was to watch the Eurovision Song Contest final that started at 9pm (oh, I can’t believe I am admitting this). I am not sure what is worse: the song ‘Lipstick’ from Jedward* or the fact that I know the words to the song. *Jedward was Ireland’s entry. ‘Jedward’ is the combination of John and Edward. Quite frankly John is getting ripped off. His brother is getting all of the letters but one. Ireland, you must be so proud. The jump kicks at 35 seconds and 1 min 20 are the best! *John and Rachel Scott, you are permanently moving to a country where this is the new #1 single. Just sayin'. On a brighter note, I now know that the country Azerbaijan exists. Congratulations Azerbaijanian’s. 2. Daniella Katzenberger: Naturally Blonde. Ok, before you start judging me, I primarily watch this show because Daniella Katzenberger uses such a simple German vocabulary that I find her show very informative and use it as a German learning guide. This is probably why my German is still so bad. I have asked around and, she is a savvy business woman with a successful/profitable coffee shop in Mallorca. Don’t judge a book by her poor German. 3. Herbert Gronemeyer. This is Germany’s Bruce Springsteen. A professor at the University let me borrow one of his greatest hits CD’s that was sung in English and now I am hooked. He sells out every soccer stadium in Germany. 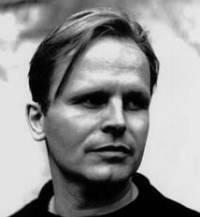 My goal is to not only go to a Herbert Gronemeyer live concert, but more importantly, understand his German songs. Honorable Mention: Dortmund won the German Bundesliga Championship. Hey, Duetscher Meister, BVB Borussia! Week 2 and 3 of Dana and Dylan being gone were lonely and quiet weeks for me in Germany. I have had some fun, but have done most things alone (or with Oscar). My office in Münster was getting a fresh coat of paint and new furniture this past week, so I have been working from home. The upside with working from home is that I get a lot of work done, and extra sleep. The downside is the lack of human contact. Adding to this lack of human contact is my awkward phase of German speaking. I can now speak enough German to get by, but not enough to be interesting enough for anyone to really want to engage me in a deep conversation. The people I have actually talked to are 50-something year businessmen and nice old lady telling me about her sick brother in law. Other than that, nobody else wants to speak to me. Two Saturday's ago, I traveled to Dortmund to watch the final soccer game of the regular season and experience the German Bundesliga Championship celebration for my favorite team, BVB Dortmund. Before you jump to any bandwagon conclusions, you must know that I have been a Dortmund fan for the last 7 years. I would even try to watch on the Internet as many Dortmund games as possible on Saturday morning’s while living in the US. Actually living in Germany during a Championship run has been really special to watch. I was not going to miss the celebration. I was not alone. The entire city was packed with Dortmund supporters, young and old. It was a phenomenal sight. I ended up watching the game from the sidewalk of a bar in a residential neighborhood between the Stadium and City Center near Kruetzstrasse. As soon as the game ended, the party around the entire city instantaneously went into overdrive. The parties spilled into the streets and the orderly mayhem ensued. The riot police did a good job keeping things in order. The mass of people filtered from the stadium to the city center in an impromptu parade through the streets. City Center in Dortmund 3 hours before game time. Everyone heading back to the city center from the stadium. Impromptu parade heading back into the city center. Well, this week has been a little different than the last two. Dylan came down with a nasty cold on Sunday that sidelined us most of the week. He was "croupy" Sunday and Monday - the first time since he was a little baby - and by Wednesday morning he still wasn't getting better so we took him to the doctor. Dylan hasn't gone to the doctor since last August, so of course it is inevitable that when we're traveling he needs to go. They thankfully checked his ears and caught an ear infection and put him on antibiotics. Within 24 hours of starting the antibiotics he was like a completely different kid. He is still on the mend, but recovering quickly thanks to the meds. Dylan lay on my lap like this for about 30 minutes while I tickled his back and face. Rarely does he sit still that long for anything. Friday night we felt Dylan was well enough to be left with a babysitter so my parents and I could go out to dinner and have some time together that wasn't interrupted by Dylan shouting "Oma!" "Papa!" "Mommy!!!" all the way through our meal. We headed into downtown Annapolis for a yummy open-faced prime rib sandwich at The Federal House - highly recommended. I wonder what "open-faced prime rib sandwich" is in German? 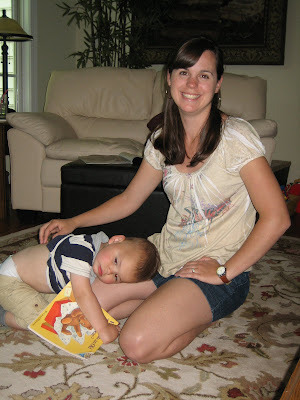 Dylan was a dream for the babysitter - no crying, no fuss; just the kind of a report a mommy likes to hear when she comes home. 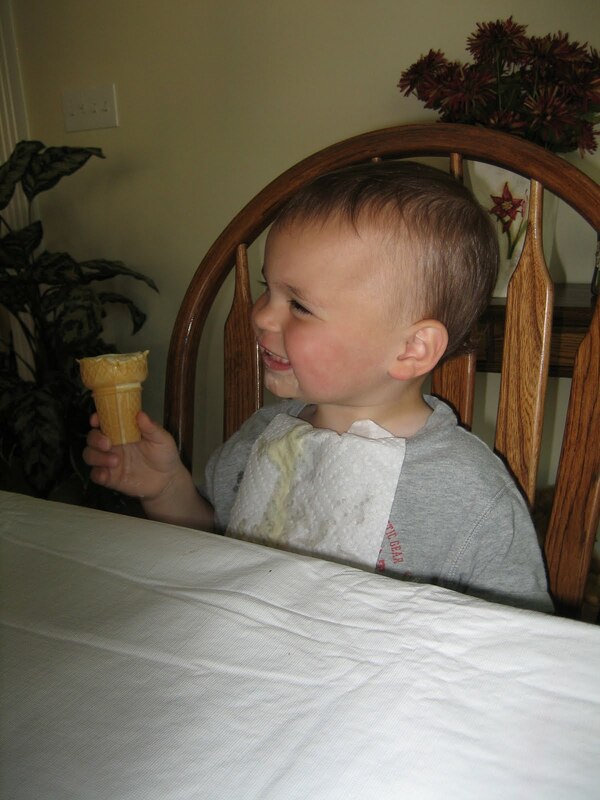 His reward for good behavior is a yummy ice cream cone. On Saturday we ventured into D.C. in the morning and walked around the DuPont Circle area where there are tons of restaurants, bars, shops, boutiques and fun places and people to see. Dylan had a great time holding "Papa's" hand and pointing out all the taxi's, busses, police cars, trucks and "autos" that we walked passed. We also had amazing cheesesteak sandwiches at JJ's Philly Cheese Steak on 14th Street for lunch, almost ruining out appetite for dinner. Dylan and "Papa" on the street in D.C. I think Dylan got the "Mohr" long-and-lean body type gene. Sunday we spent the warm morning walking around the Naval Academy in Annapolis and enjoying the nice weather. Dylan enjoyed sitting on top of the cannons. In the afternoon I packed all of our stuff up and am still trying to squeeze it all into my suitcase. Good thing it's not loaded. This one is just his size. Dylan peaked inside the mail slots of every single home and business in downtown Annapolis. I can't believe our three weeks went by so fast! Well, for Bryan and Oscar they were the slowest three weeks ever. Bryan said that Oscar just sits around the house and cries all day for no reason. Bryan probably does the same. Hopefully our long journey home will be as uneventful as our long journey here and that Dylan will be well-behaved. Dylan and I now have two of three weeks back in America under our belts. Wow - this trip is really going by fast! We haven't been super busy and most of our time is spent playing with Dylan around the house, in the yard or on the neighbor's swing sets. One of the things I like best here is the simple pleasure of going to the grocery store or to Target. It's amazing how HUGE all of the store are here, especially Target, and all of the different options we have in America. I plan to take a photo of the cereal aisle in the grocery store for one of my friends in Germany who didn't believe me that there could be such a huge cereal selection. Last week we had two big outings - one to Watkins Regional Park and the other outing was to the National Zoo. Watskins Regional Park is about 15 miles away and has a train, small farm, carousel and massive playground. We first tackled the train, which was a cute little amusement park style ride that took us on a 10 minute train ride through the woods and around the farm. I have never seem Dylan so overjoyed and excited about any kind of ride as he was on this train. He giggled and smiled ear-to-ear the entire time. Even after the train ride, whenever he heard it nearby he ran to the fence to watch the train go by. 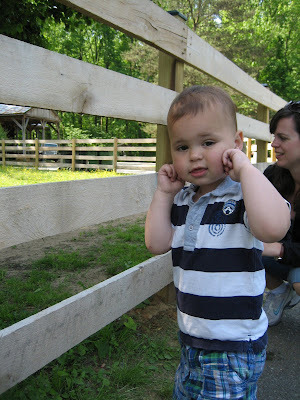 He also loved checking out the chickens, peacocks and other birds, but he wasn't really into the larger farm animals like lamas or ponies. He tired himself (and Mom and I) out running around the playground with about 100 other kids who were there on a field trip. We all needed long naps when we got home. 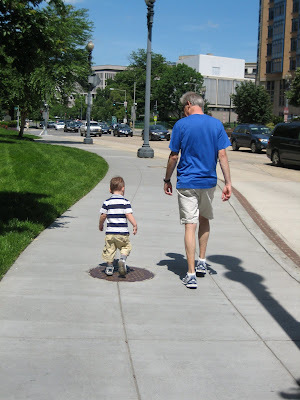 The very next day, we took Dylan to the Smithsonian National Zoo in D.C. 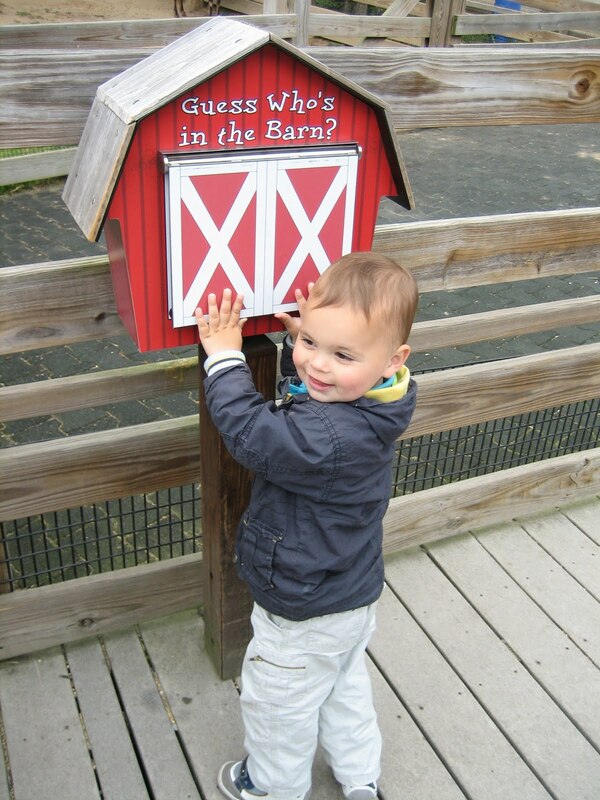 He was a great little traveler that day and loved walking around holding "Papa's" hand and checking out the animals. His favorites were the elephants and the panda bear. He goes crazy now whenever he sees an elephant on TV and his impersonation of an elephant is pretty funny. Dylan has come down with a nasty cold this week and we learned today that he has an ear infection also, so our third and final week in the U.S. is pretty low key. He's been in good spirits despite feeling super sick, but hopefully in another 24-48 hours the meds will kick in and we'll be able to have some more fun the final few days that we're here. Keep us in your prayers that nobody else comes down with what he has! Boy, those chickens are noisy! 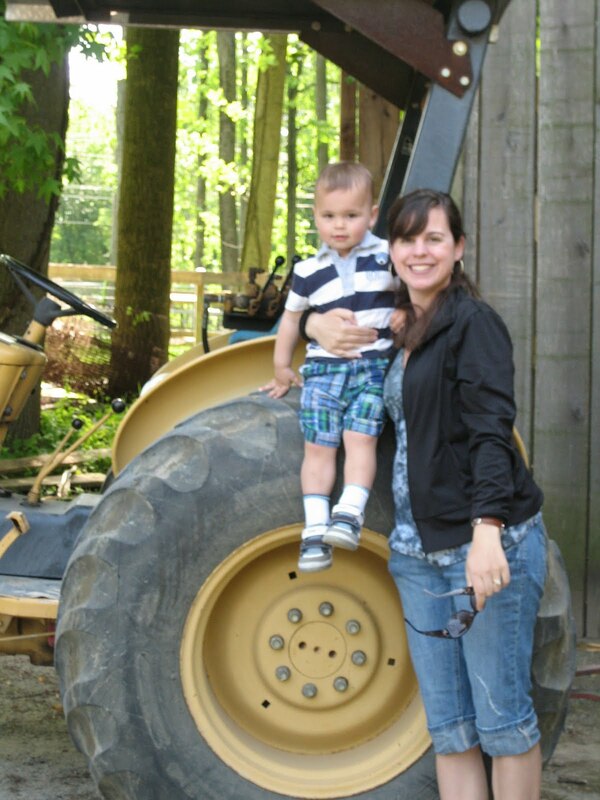 Dylan and Mommy on a tractor! He is soooo jealous of everyone on the train. Riding the carousel with "Oma." Dylan can barely contain his excitement for being on the train. 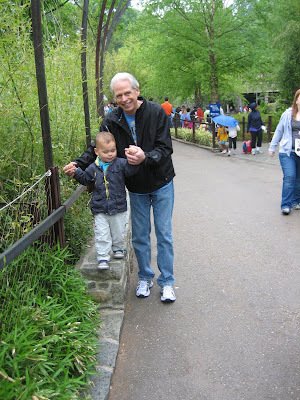 Walking along the wall at the zoo with "Opa." Guess who's in the barn? Living in a foreign country has its everyday challenges. The obvious language barrier can make normal errands challenging and sometimes you want some Wendy’s and other foods we miss the most. One of the most underrated challenges that I’ve noticed recently is the pop culture disconnect between Germans and Americans. This becomes a problem when I use these pop culture references speaking with colleagues or at a party and they almost always fall flat. By the time I am done explaining the reference, both I and the other people are exhausted and the reference is rendered as another one of my many stupid comments. So, in order to save some future awkward conversations, I have listed some recently used American pop culture references. If you don’t know the reference it could be a little strange. Though I believe it’s just a matter of time before Rebecca Black becomes really popular in Germany. If David Hasselhoff can stay popular here, anybody can. 133 million views so far on youtube. I personally think the Jimmy Fallon and Stephen Colbert rendition was even better. At a recent birthday party, I was tearing up the dance floor with my dance moves. That was until I tried the juggling dance. With the scene of Will Ferrell on the most recent The Office fresh in my mind, I started to juggle 5 balls. I even used one stunned onlooker as a prop (ala Phyllis in the scene.) I thought it was hilarious. The blank looks from the people at the party told me I was the only one. I really want to do the juggle dance again (like I will ever get invited to another party after the first juggle dance) so here is the juggling scene from the Office. Maybe now I can get at least a pity laugh. If you have't seen it yet, I really encourage you to watch this. It's hilarious. This is just one of many Seinfeld references I use every day. 42% of everything I say has to do with a Seinfeld reference, so not being able to Seinfeld quotes and references really decreases my ability to effectively communicate. I still don’t understand why Seinfeld never became popular in Germany. I can scan the TV channels in Germany at any time in the morning and have a 100% chance of seeing something with Fran Drescher in it, but Seinfeld re-runs can’t make the cut. What are some other pop culture trends that we may have missed in America while living in Germany the last 8 months? You can take me out of Michigan, but you can't take the Michigan out of me. That means, when hockey playoffs start and you are from Michigan, you stop what you are doing and watch the Detroit Red Wings playoff hockey games. I normally don't even watch the regular season games, but once the playoffs come, I alter my schedule around games and it's all I can talk about. When the Red Wings get eliminated, you can go back to normal life. Playoff beards have become quite common in the NHL, you can see the 10 most fascinating NHL playoff beards of 2011, where the players are not allowed to shave their beards until they are eliminated from the playoffs. I learned on Wikipedia that you can trim your beard if you need a change of luck. I trimmed my beard when we lost 2 in a row to the San Jose Sharks. It was just in time for a presentation I needed to make at the University. Currently, Detroit is tied with San Jose 3 games to 3 and play the deciding Game 7 tonight (or tomorrow morning at 3am, depending on where you live.) They are looking to become the 4th team in NHL history to come back from being down 3 games to 0. I am setting my alarm to watch it. Oh yeah, and this is my uneventful week 1 update from Germany while Dana and Dylan are gone. I haven't done anything else noteworthy. Hopefully, my Week 2 update will be more eventful. We are Hockey Town, No Limits! Taken before Dana and Dylan left. Dylan was born during the 2009 Stanley Cup Finals, we watched Game 6 together in the hospital. Playoffs 2010. We have gotten good mileage out of this jersey, though it will need to be retired after this season. 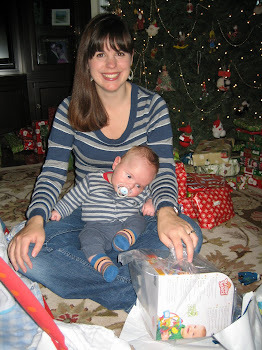 Thanks for the awesome baby gift, Amy and Rob. Playoff Beard in Full Effect! Photo taken today. Oscar rode the bus with me to Munster. He thought he was pretty cool. Oscar chilled in my office during the day. He came with me to work on Monday and Wednesday. Week one of our three week trip to America is almost over, so I figured now is a good time to give an update on what we've been doing. We thankfully had an uneventful day of travel to get here. Dylan was a superstar and I am so thankful that he was such a happy little traveler for our big day. He was super calm and didn't even fuss when the stupid TSA agents in the Dusseldorf airport decided that he and I were a threat and needed a pat down. Yes, they seriously made me hold Dylan's arms out so they could pat him down and run their fingers around the elastic waistband of his monkey-sweatpants to see if my boy had a diaper-bomb. I truly wish he had had a majorly poopy diaper at that moment (a different type of diaper-bomb, I guess) so they would learn their lesson about the real dangers of sticking your hands in a 23-month-old's pants. After 14 hours of travel, we made it to Baltimore. Since we arrived in the evening and were exhausted, it was easy to get Dylan to go to bed at a normal time and sleep for a full 12 hours. So, almost immediately Dylan was put on the right timezone - a miracle! This week seems to be the week where I sate all my food cravings. I've had Cheerios, Everything bagels with cream cheese, cheddar cheese, Five Guys Burgers and Fries, cookie-dough ice cream, Cherry Coke and much more. Still on the list is Rootbeer, Smartfood Popcorn, Mac and Cheese and a few others. We've spent a lot of time just at home, playing in the yard and going to the playgrounds. Dylan loves his Oma and Opa - he takes their hands and drags them all over the house. It's so nice for me - because I get a break! He's way more interested in playing with Oma and Opa than with me. So I actually get to read the newspaper in the morning and drink my coffee in peace while my Mom chases Dylan around. Dylan also loves to dance with his Oma and every morning the first thing he does is run over to the iPod doc and say "Dance! Dance!" and request some tunes. Coming up this next week are more trips to local parks and playgrounds, and hopefully a trip to the D.C. zoo on Friday. Dylan does a pretty hilarious elephant impression, so I'm excited to see his response to a real elephant. Yummy ice cream cake! Boy, was he wired after all this sugar! 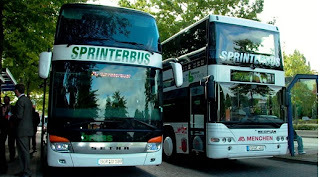 So far, I have had mixed reactions to using public transportation (SprinterBus) for my daily commute from Borken to Munster for the last two weeks. 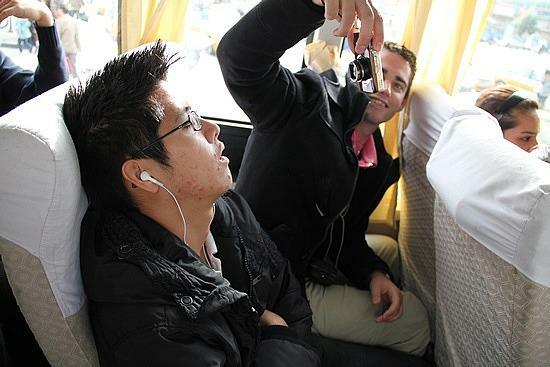 Here is a breakdown on the pros and cons of using public transportation in a foreign country. *And yes, I’ve started a spreadsheet to compute the overall savings of having a student pass over the next 6 months to keep track of the results. I’m determined to use the time on the bus to get work done. It’s essentially two hours each day that can be wasted or used to be productive. I can get a lot of uninterrupted reading and work time in if I come prepared for the ride. Unfortunately, this component is in intense competition with ‘Con Number 1,’ Motion Sickness. If you get bored, you can really freak other people out on the bus. You can stare at them from across the aisle or even better if they are sitting directly next to you. That’s even better because they are sitting directly next to you, it means the bus is packed and they can’t get up and move seats. Also fun is sitting directly next to someone on an empty bus. I haven’t actually sat down and stayed, but have asked someone to move their bag over as a joke. How do you say ‘just kidding’ in German? You must be careful with how much fun you have with other people because there is a good chance you will see these same people a lot if you are making the daily commute. I am already starting to see this trend after only 2 weeks. It’s nice knowing that I don’t have to fight rush hour traffic each day. Also, because of the bus lanes in Munster, the time it takes to drive from Borken to Munster is the same. The nice part about riding the bus is that if you want to close your eyes and rest, you can do so. This is a really tough one for me. I get motion sickness very easily. Can you build up a motion sickness tolerance over time? I hope this is possible, because right now I get off the bus very motion sick. I don’t want to take and become dependent on any pills/drugs to get over it, I just want to condition my body to not get motion sick so I can work on the bus. The SprinterBus only leaves Borken every 27 minutes past the hour and only leaves Munster 34 minutes past the hour. If I get caught in the office past 7:34 pm, then I would have to take 2 hours of trains to get to Borken. At least it’s a good excuse to get out of any really late meetings. This set schedule is slightly inconvenient, but it does make you get out of bed and out the door more promptly in the morning. I really like singing praise and worship songs in the car by myself. Usually this is accompanied by tears and crying. I can’t help it. That’s just the way I am. Try singing Hillsong’s ‘Tear Down the Walls’ and ‘Arms Open Wide’ back to back without crying. I can’t do it. This is a reversal of the previously mentioned ‘pro’ bullet point of being able to mess with other people. Other people can also mess with me. Nothing makes me feel more uncomfortable than closing my eyes for a few minutes and opening them to someone staring right at me. I should also mention in this section the potential for someone to have body odor to sit next to me. It hasn’t happened yet, but I am not looking forward to that inevitable day. It's a German tradition each spring at Easter to make a huge bonfire and we heard from our neighbors that the biggest fires were going to be in Gemen, which is a suburb of Borken. We packed up Dylan on the back of the bike and headed off to Gemen, about 2 miles away from our house. The first fire we came to was probably the biggest bonfire I've ever seen. It was behind the local convent and there were a bunch of nuns around handing out flyers with hymns on them. There were about 60 people there and it was crazy hot (obviously) because those nuns really know how to build a good fire. After a few minutes we decided to go further into Gemen to see if there other fires since we didn't know anyone at this fire, and we had secretly stashed two beers in Dylan's diaper bag and didn't want to crack them open in front of the nuns. Another 1/5 mile down the road we could see the smoke from another huge fire and there was singing and a lot of people heading that way. Just as we turned down the path, Bryan's front bike tire popped and we were forced to stop. It was already past Dylan's bedtime, so instead of venturing on, we hoofed it the 2 miles home pushing a sleepy Dylan on the bike. One our way home Dylan was pooped on by a bird. We figure the popped tire and bird poop was the Pope's Revenge for us ditching the nun's fire and smuggling beer. April 30 / May 1 is a really big deal around this part of the world. If May 1 falls on a week day, then it's even a national holiday for everyone. On Saturday afternoon, we went over to our friends house for our first German-style BBQ. The main difference between American BBQ and German BBQ is that in America, we prepare everything to be served at the same time, whereas here only a few pieces of meat are put on the grill at one time so as your munching on salads and bread and other dishes, the meat comes gradually. It makes it possible to sit and eat and talk for a really long time, as opposed to scarfing the entire meal down in 15 minutes ala American-style. Dylan enjoyed his time playing in the garden with his little buddy, also. These two are double trouble. After we left our friends house, we took a detour through Borken's town center on our way home to check out the town's official Tanzen in den Mai" celebration. There were some food and drink tents out as well as DJ and about 100 people or so milling about. The sun had only just gone down, so not a lot of people were out yet. The scene had the potential to get really fun, but we were stuffed from all German BBQ and it was nearly 2 hours past Dylan's bedtime, so we didn't stay long. Some friends of ours invited us to join them at a house in Raesfeld, a nearby town, for a May Day Party. 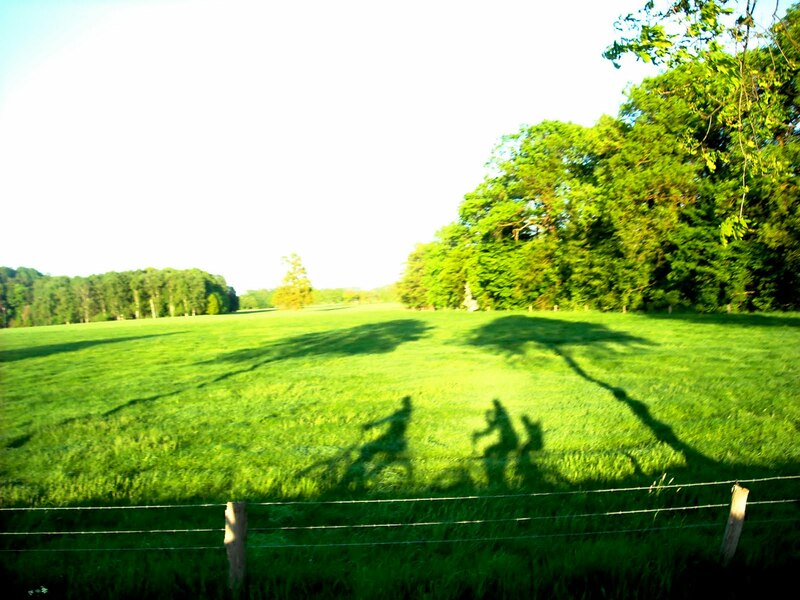 After Dylan's nap, we packed up our bikes once again and headed out for a windy bike ride to Raesfeld. We arrived around 5:30 p.m., just in time to see the band playing some classic rock, from Tom Petty, Lynyrd Skynyrd, Rolling Stones and more. There were about 75 people there, lots of kids, toys, animals and Dylan's girlfriend, Amy. My son is completely smitten with this little girl and follows her around like a puppy-dog calling her name and chasing after her (much in the same way Bryan chased after me in college). The weather, food, atmosphere, people and music were all excellent!